For 30 years Christendom College has made a vital contribution to American Catholic life through its solid spiritual formation and its liberal arts curriculum. While some colleges in this Guide may match its Catholic commitment, it is unlikely that any exceeds it…Christendom sets a standard for fidelity and traditional education against which other Catholic liberal arts colleges are measured. In joyful adherence to the principles set forth in Ex Corde Ecclesiae, Christendom is primarily an Educational Apostolate, with an emphasis on helping the students grow intellectually and spiritually in their love and knowledge of God and the created order, and thereby, ultimately helping them to attain eternal salvation. In short, we care about the development of the whole person and the welfare of their souls. The College, although lay-run, has the approval of the Ordinary of the Diocese of Arlington, Virginia, in which it is located. Christendom was founded in 1977 with the assistance of then-founding Bishop of Arlington, the late Bishop Thomas J. Welsh, and continued to receive the support of his successor, the late Bishop John R. Keating, and the Third Bishop of Arlington, Paul S. Loverde. Currently, the Fourth Bishop of Arlington, Bishop Michael Burbidge, is very supportive of Christendom and her mission, continuing on this great relationship between the college and the Diocese. All professors are Catholic and ALL of them make an Oath of Fidelity to the Magisterium and a Profession of Faith each year in the presence of the Diocese of Arlington’s Bishop Michael Burbidge. All classes, whenever possible, are taught with a Catholic vision and worldview. When teaching history, it’s with a fuller Catholic understanding – and we explain how the Catholic Church has made an impact on history. When teaching philosophy, one is open to the truths of natural reason and the fullness of truth about God, man and the created order, with a strong emphasis on St. Thomas Aquinas’ teachings. Among other subjects, all students take at least 6 classes in Catholic Theology and 6 in Philosophy (which is very Thomistic). Our rules and regulations governing student life are intended to help students embrace the fullness of Catholic life. Reflecting the dignity and serious nature of the course of studies, there is a professional dress code for class, Mass, and lunch; a modesty dress code at all times; alcohol, TVs and internet are not allowed in the residence halls; intervisitation between the men and women in the residence halls is not allowed; and a curfew for freshmen and sophomore students who are under 21 is enforced. We believe that these rules are beneficial for the growth of the student’s moral, intellectual, and spiritual life. The College, in its daily life, also shows a deep commitment to the Sacraments and sacramentals of the Church: Daily Mass, Daily Adoration, Daily Confession, Daily Rosary, Daily Evening and Morning Prayer are offered. We are attempting to help rebuild Christendom, that is, a time in history when the culture was inspired by the Gospel and the teaching of the Church. We celebrate the traditions of the Church and enjoy the many liturgical and cultural feasts of the Catholic Church and her rich heritage, even cancelling classes each year on the Solemnity of All Saints (November 1st) and the Solemnity of the Immaculate Conception (December 8th). Beautifully celebrated liturgies are a trademark of Christendom. 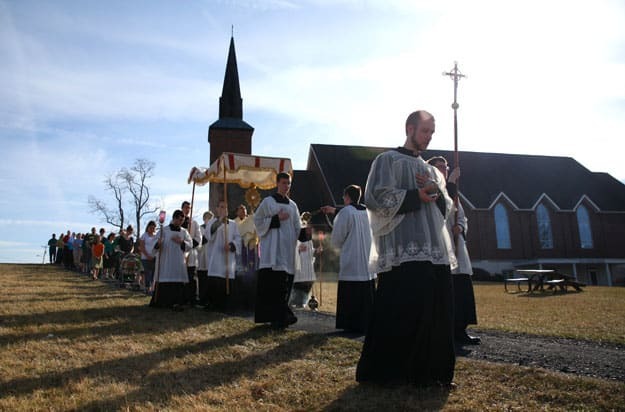 Gregorian chant, polyphony, traditional choir, incense, Novus Ordo Latin Masses as well as the Extraordinary Form, traditional hymns, Eucharistic and Marian processions are all part of this tradition. Students are given ample opportunity to take part in corporal and spiritual works of mercy, both on and off-campus. Catholicism is not simply a religion and theology is not merely a class one takes at college. It involves an openness to the True, the Good, and the Beautiful, wherever found. We believe that Catholicism is a way of life and on our campus, it is the “air that we breathe.” Catholicism, joyfully lived in fidelity to Christ and His Church, affects everything that we do here, from our Commencement speakers to our student clubs, from our curriculum to our Masses.